Loblaw discovered that Canadians were overcharged for the cost of some packaged bread products in our stores and other grocery stores across Canada. In response, we're offering eligible customers a $25 Loblaw Card, which can be used to purchase items sold in our grocery stores across Canada (stores listed below). All Information on this Website is based on prior seniors experience and information we have been able to gather from different organizations and government agencies. We don’t speak on behalf of these organizations/ government agencies and we don’t endorse any of them. Address # 5 Willow Lane (off of Lorne street and across from the back entrance into Mel's). Parking at Rose's Independent Store (Save Easy), or in the back parking lot. Deliveries accepted on Tuesday's (8:30 a.m. - 11:30 a.m.), as well as on Wednesday's (7:30 a.m. - 11:30 a.m.) Phone # (536- 4164). If it is your first time using the Foodbank. You will need your New Brunswick (NB) Health Care to indicated you live in NB. They will ask you to fill out a very brief application/budget. 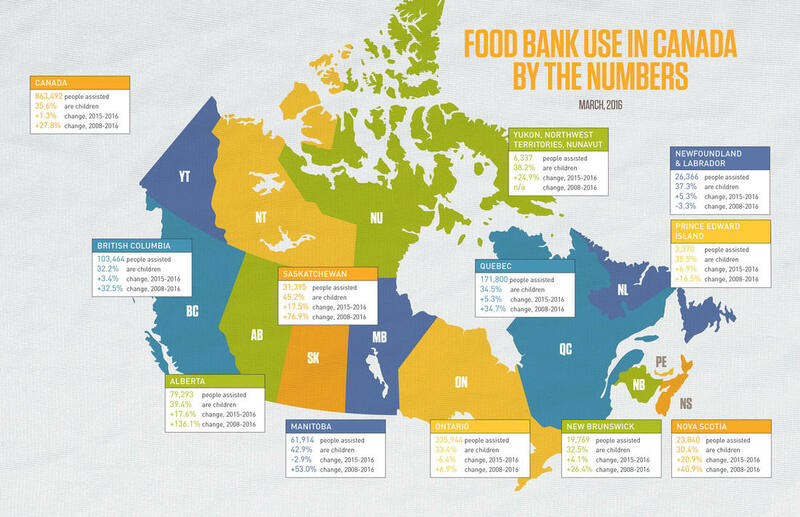 If you want to donate to fight hunger, remember that it's always best to check what local food banks need. (Many food banks have wish lists on their websites.) You don't want to burden food banks with goods that take up space and aren't a good fit. The Human Development Council holds the intellectual property rights for the information on this site. You may display it on your computer and print or download this information for non-commercial, personal or educational purposes only. You must credit The Human Development Council as the source on each copy of any information that originates from this site. New Brunswick Food Bank Association - Click Below on Image. TORONTO - A new report says the number of households in Ontario turning to food banks for the first time has shot up by 20 per cent since last year. The report from the Ontario Association of Food Banks found just over 17,000 households used food banks for the first time this March, compared to 14,206 last year. MONTREAL-Quebec food banks and some of the province's grocery stores are teaming up to ensure that perfectly edible food will end up in the hands of those who need it most and not at local landfills. A repurposed cabinet atop a pole was the centre of attention in Winnipeg's Centennial neighbourhood Sunday, after a local couple installed a Community Cupboard on Fountain Street near Logan Avenue. "I didn't know people would be so interested in giving and I didn't know that so many people would be in need and walking by," said Kelly Hughes, who built the cupboard with his partner Andrea Vaile. Mississauga ON (March 21, 2017) - Food Banks Canada today announced a landmark grant from the Walmart Foundation of $2.6 million, which joins a previous grant of $2 million to Food Banks Canada, to build capacity in the Canadian food bank network.